More and more each day, we rely on technology to assist us in our lives. From fitness trackers that monitor our physical activity to thermostats that automatically adjust the temperature in our homes based on our schedules, we are enjoying unprecedented levels of usefulness from various gadgets, mobile apps and other electronic devices. However, for many fleet owners and parts managers in the heavy duty industry, this level of convenience seems to disappear when they arrive at work. After checking their phones one last time to make sure they closed their garage door—and using the phone to close it remotely if they forgot—they spend the next 8-10 hours personally monitoring maintenance schedules and more to avoid equipment issues and catastrophic failures that can bring their entire operation to a halt. Of course, one of the most important elements of preventive vehicle maintenance is replacing all of the filters at the recommended intervals. You can keep tabs on months or miles between filter changes with calendar apps and other electronic tools, but how can you be absolutely sure you’re getting the right filters for each vehicle? Vindetech by Luber-finer makes it easy. It’s the first online search tool in the heavy duty filtration market that uses the Vehicle Identification Number to find the exact filters you need. An incorrect oil filter might not seal properly to the engine block, even though the threads appear to line up and the filter seems to screw on properly. If this occurs, there can be oil pressure issues, leaks resulting in the possible loss of all engine oil, and problems with particulate entering the engine and causing damage to the cylinders and engine block. An incorrect air filter will not match up with the filter housing on a vehicle’s engine, leaving gaps where dirt, dust and harmful particulate can slip by. These contaminants can also damage pistons, cylinder walls and the engine block if they are allowed to enter the engine and mix with the oil. An incorrect fuel filter will also fail to restrict the maximum amount of debris due to improper connections. Because modern fuel systems are extremely sensitive to contaminants in the fuel, even the smallest particle can cause expensive damage by eroding the fuel pump, valves or injectors. Fortunately, there’s Vindetech, Luber-finer’s new search tool that is designed to help fleet maintenance managers search for and quickly find the filters they need for their scheduled filter replacements. Due to the potential variation between engines in vehicles from the same manufacturer and even the same model year, it’s important to search by the Vehicle Identification Number. You can begin the Vindetech filter search by entering all 17 digits of a vehicle’s VIN in the field at the bottom of the left column of any page on the Luber-finer website. The tool confirms the VIN, model year, manufacturer and other vehicle details, then produces a list of the specific filters that are required for servicing that exact vehicle. Additional features include VIN search capability for light and medium duty vehicles as well as the ability to upload multiple VINs at once from an Excel spreadsheet. The tool also generates a PDF packet of all search results that users can download for future reference. Entering the 17-digit VIN is the best way to ensure you’re getting the exact filters that are required for servicing a specific vehicle. 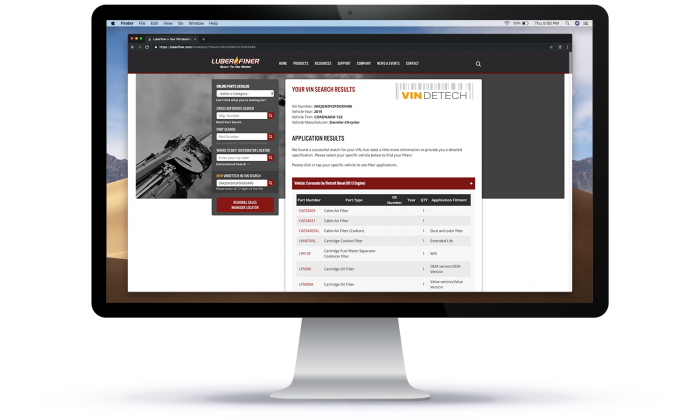 Vindetech is the latest initiative in Luber-finer’s effort to develop digital resources that make filter purchasing and resource planning easier for everyone in the heavy duty industry.